Don’t you hate it when people don’t follow the rules? For example, a while back, I was trying to park my car on State Street – on that block between Waseca Music and Domino’s Pizza – and I pulled up next to the parked car in front of the parking space that I wanted, preparing myself to Parallel Park. I put on my turn signal, to indicate to the car behind me that I was going to back into that spot. But then I noticed that the car behind me pulled into my parking spot! This driver was obviously not following the rules, which said that I was there first and that I had made a claim to that parking spot by putting on my turn signal. I confess that I was disgusted that this person didn’t seem to get the rules. The people gathered around Simon the leper’s table probably felt disgusted too. As they dined – probably in a courtyard, as people often did in that hot middle-eastern climate – a woman came with her beautiful alabaster jar, broke it open, and before they knew it, poured its valuable contents out, over the head of Jesus. She wasn’t following the rules at all. The guests with Jesus were surprised and then angry. For them, her actions seemed careless or frivolous or even self-indulgent. The value of that perfumed oil in that alabaster jar was 300 denarii, which in today’s money would be about $30,000. Imagine a jar of perfume worth $30,000! It would be a rare treasure. And think about it—think about how the value of the contents of that jar could have been used for the poor! You and I know that Jesus cared deeply for the poor and that he calls us to give to the poor. So why does Jesus stand up for this woman? Jesus says, “You always have the poor with you, and you can show kindness to them whenever you wish; but you will not always have me.” (14:7) His words puzzle us. They have been often misunderstood as if Jesus was dismissing the needs of the poor. But that’s not the case. We read in the gospels that Jesus himself was poor. Jesus knew hunger and need. But Jesus also knew what was in people’s hearts. The focus in this story is on this woman’s action toward Jesus. Her action was a costly act of love. It was costly because of the value of the perfume. And it was costly because of the risk she took in her action. And it made the people gathered around that table angry because she wasn’t following the social norms at that time. For example, in that day, there was a rule that a woman was never to stand higher than a man. For the woman to anoint the head of Jesus she would have to break the rule and stand over him. What would have been more common and readily accepted would have been a woman kneeling at the feet of Jesus, washing his feet. And this woman anoints Jesus’ head, something that a host might do out of respect for an important guest, using a few drops of oil. But she pours the whole jar on his head. There could have been different reasons why she might have done this. But Jesus says it was an act of loving service, to prepare his body for burial. Somehow she knew he was going to die; perhaps she even knew that his death would be for the forgiveness of sins. And she wanted to show her love and gratitude. Do you think she was scared when she broke the jar? I bet she was. She knew she would be criticized. But her love for Jesus gave her courage. Those around the table were focused on rules and customs. She was focused on a love for Jesus that she wanted to show. Those around the table were focused on bottom line and balance sheet, and she was focused on an act that would show love and gratitude. We all know there are good reasons for rules and for order, but breaking this jar of costly perfume over the head of Jesus tells us that love must lead, that love has authority. 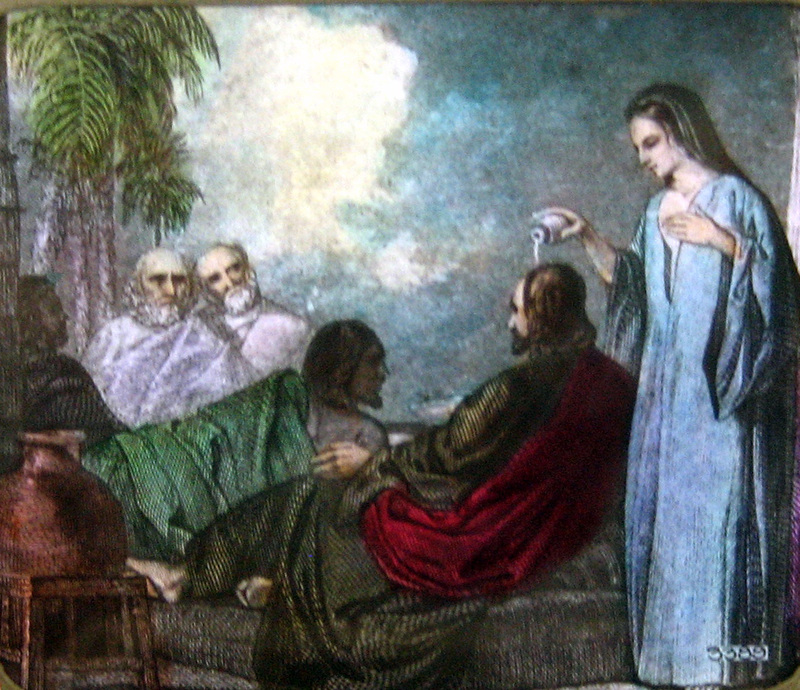 Jesus says, “She has performed a good service for me…she has anointed my body beforehand for its burial” (14:6, 8) It was an act of compassion and loving-kindness for her Lord who was about to suffer and die. And Jesus says, “Truly I tell you, wherever the good news is proclaimed in the whole world, what she has done will be told in remembrance of her” (14:9) In other words, what this woman did serves as an example to us. That’s why her story is to be told and remembered. And what is it about her action that is an example to us? It is her love – bold, courageous, costly love. A kind of love that should be at the center of our lives as people of faith. Like Jesus’ words, the Pope’s words are an attempt to make a course correction—stating that love should lead us, even when that love means that existing rules and customs are challenged. The woman with the alabaster jar took a risk and broke with tradition. She was criticized for it and yet Jesus stood by her side and valued her action, because she got it. She understood that love must lead. On December 1st, 1955, a woman named Rosa Parks sat in the front section of a city bus, a section reserved only for white people. She went against the rules of the time, because something deep down inside of her told her she was a valued child of God and that people should not be treated as less because of the color of their skin. Someone stands up for a child who is being neglected. Someone befriends a person who is poor or grieving or struggling – Costly demonstrations of love. A person quietly gives more to a church or charity, spending less on dining out and expensive purchases, because they have received so much love and grace from God and feel an overwhelming desire to show their gratitude in this way – Costly demonstrations of love. Someone volunteers to take on a responsibility that has something to do with their faith. It takes time and doesn’t pay any money, but they feel as though God is calling them to do it. Jesus knew love must lead. That’s why he went to Jerusalem, that’s why he stood up to the leaders who had forgotten the poor and the downtrodden and sinners. That’s why he was willing to be rejected, scorned, and falsely accused. That’s why he wouldn’t stop proclaiming his love for people such as us. That’s why he was willing to be nailed to a cross – because love must lead. He did it as a demonstration of his love. Remember this sequence of images that make up God’s word to us on this Palm Sunday: First, a jar filled with expensive ointment – broken and poured out on Jesus’ head, because of this woman’s love for Jesus. Second, Jesus’ body, broken, and his life poured out for the world, because of Jesus’ love for you and me. And third, as we let the same mind be in us that was in Christ Jesus, we too will be broken – broken by deep compassion, broken by grief for the hurts of others, broken by costly acts of service – so that the treasures we have inside of us – Jesus’ love and grace, his kindness and faithfulness – will be poured out and shared with the world. Such demonstrations of love are costly. But we do it, knowing that love must lead.